Lifetime has debutted the trailer for the remake of 'Steel Magnolias' which features an all black cast. 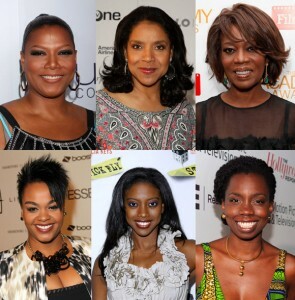 The remake stars Queen Latifah, Phylicia Rashad, Alfre Woodard, and Jill Scott. Based on the preview, I can say I'm definitely looking forward to seeing the film. I was on the fence when I heard about the film being made. I didn't understand why an all black cast had to remake a movie that was already done to perfection; besides, their are so many wonderful books out there written by black authors that deserve a chance to be made. But after watching the preview, I've definitely changed my tune. I can't wait to set my DVR (I can't watch anything live because I hate commercials). I'm not sure how I feel about Queen Latifah playing M'Lynn. I was sure that would be the character that Phylicia Rashad would play, but I'm definitely loving Alfre Woodard as Weezer. Check out the preview below and tell me what you think. Ooooh! I can't wait to see. This movie might have the same name, but it is different in so many ways. I can't wait to see. I couldn't find an air date on the lifetime site. Yeah Queen as M'lynn...she is too young and her face is too young. She can easily play an older sister. Her acting may be good but visuallybit is hard to imagine her as Shelby's mother. I am sitting here reminiscing. We recorded Steel Magnolias and the episode of Dwayne and Whitley's wedding on the same tape. It was a go to during long summer days growing up. It will be hard not to have a critical eye. But I look forward to seeing it. I was beyond excited when I heard about this remake. It's great that Lifetime is making more of an effort to put out material with African Americans. Plus, diabetes is something that really affects our community. Can't wait to see it!